Evaluation copies must be ordered on a school account. ORT Story Sparks is an emotionally-engaging fiction series that will fire children's imagination and deepen their comprehension skills. This Handbook is designed to help you get the most from these stories in the classroom; it includes guidance on comprehension, practical advice and useful resources including photocopiable activity sheets. Oxford Reading Tree Story Sparks is a series of imaginative, emotionally-engaging stories which encourage reading for pleasure and a love of reading. 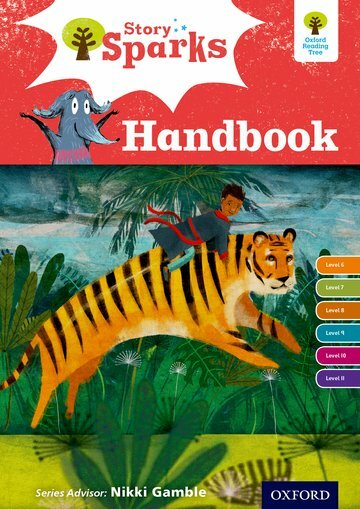 The stories and the Handbook develop the deeper comprehension skills children need to reach the higher expectations of the new curriculum. The series is underpinned by Oxford Assessment and Levelling, matching every child with the right book through careful grading. The Handbook is written by top authors, including teachers and educational consultants. The Handbook includes practical advice and guidance for developing and deepening children's comprehension skills, and support for engaging parents with their child's learning. It includes photocopiable activity sheets to support each story in the series. The Series Advisor is literacy expert Nikki Gamble. Inspirational support for teachers professional development plus teaching notes and eBooks are available at www.oxfordprimary.co.uk.